You are subscribed to America’s Great Outdoors Tumblr updates for U.S. Department of the Interior. 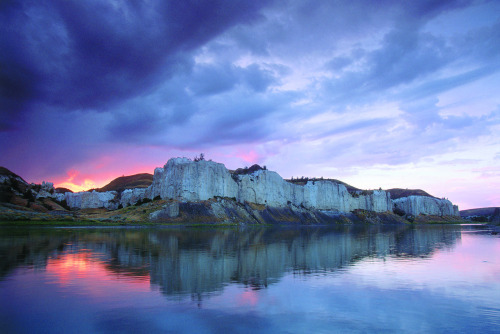 The 149-mile Upper Missouri National Wild and Scenic River flows through the Upper Missouri River Breaks National Monument in Montana. The land and the rugged, surrounding uplands (commonly call the Missouri Breaks) are defined in part by their history. The entire region was the homeland and lifeblood of American Indians. The river served as the pathway for Lewis and Clark, then the waterway for steamboats and a drawing card for fur trappers and traders. Later, the river and the Missouri Breaks were sanctuaries for desperados trying to stay a step ahead of the law. The land was also a source of hope and inspiration for several generations of homesteaders. Today the public lands in the monument make a significant contribution to the local lifestyle and the regional economy. Within the monument you can float the river, fish, hike, hunt, drive for pleasure, find a little solitude, enjoy a sense of exploration or simply marvel at the variety of resources around you.